Tá neamart forleathan déanta ag staraithe na hÉireann i litríocht na Gaeilge. Féachann an leabhar neamhghnách seo leis an scéal a leigheas. Déantar anailís ann ar thuairimí Aodha Bhuí Mhic Cruitín, duine de na filí ba bhisiúla a scríobh sa chéad leath den 18ú haois, agus tugtar léargas ar dhearcadh an phobail i ré an Hidden Ireland. Ghnóthaigh an leabhar seo duais Oireachtais i gComórtas Cuimhneacháin Dhonncha Uí Laoire sa bhliain 1994. "... tá sé riachtanach go mbeadh Gaeilge agus stair ag an té a dhéanfadh an taighde is gá. Gaeilge agus stair in éineacht a theastaíonn. Dá bhrí sin cuirim an-fáilte roimh shaothar Vincent Morley ar Aodh Buí Mac Cruitín, saothar a chonaic mé ar dtús nuair a bhí sé ag gabháil d'iarchéim agus atá anois ar fáil i bhfoirm leabhair." "Cé go séanann an t-údar gur beathaisnéis a chuir sé roimis a sholáthar sa leabhar so, éiríonn leis cuntas cuimsitheach, leanúnach a chur le chéile ar bheatha agus ar shaothar liteartha Aodha Bhuí Mhic Cruitín. Is cuntas é seo a bheidh in ann fós scoláirí eile a ghríosú, ar mhaith leo tabhairt faoi a leithéid ar fhilí eile a chur ar fáil, agus ag an am céanna tá comaoin mhór curtha aige ar léann na Gaeilge san ochtú céad déag agus ar staireagrafaíocht na ré sin chomh maith." 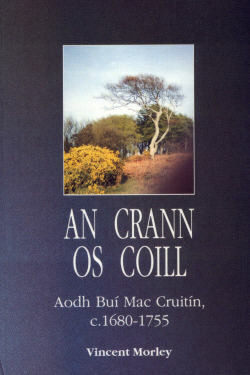 "In Morley's assessment the importance of Mac Cruitín's writing, including his poems, lies less in its intrinsic quality than in the insight it offers into the politics and ideology - pro deo, rege et patria - of those who constituted his main audience, and these are, by Morley's definition, the broad sweep of public opinion in his own county of Clare, the Irish language fraternity of Dublin, the soldiers of the Regiment of Lord Clare, and the community of the Irish College in Paris."